With great sadness, Baby died, a peaceful death on May 2nd, 2008. Baby Tweeter would sing to me when I talked to him. When Baby was out of his cage, he would fly and soar around the room and would wait to perch on my head or shoulder. Baby loved to lower his head for me to scratch his head and back. Baby liked his roommate, Sweet Tweeter. 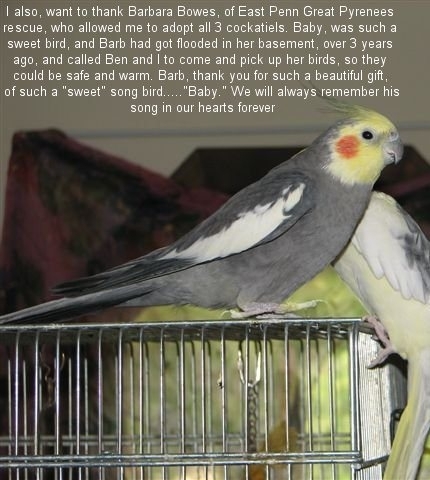 The two cockatiels along with Bobby Tweeter, came to The Gress Mountain Ranch about 3 years ago, with the Ivan Hurricane. 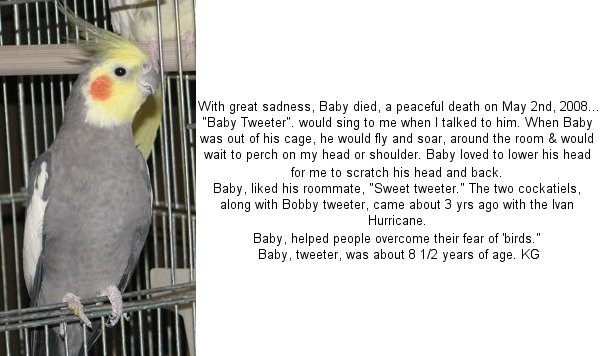 Baby helped people overcome their fear of birds. Baby Tweeter was about 8.5 years of age. K.G.